​for details or book online today! This 4 week class will give you a great foundation to begin your new obsession creating wearable art. 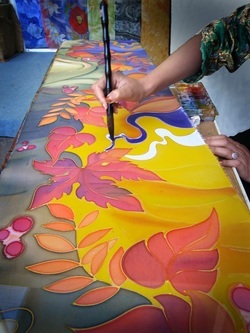 Focusing on process we will experiment with color, play with pattern and be seduced by the flow of paint and dye on silk. Half the classes will be spent exploring Chinese silk painting techniques and the other half exploring Shibori, the ancient Japanese fiber art of bound resist dyeing. Participants will leave this experience thrilled with the exquisite wearable and frameable artworks they create. If you have a group of 4 or more that would like to set up a 4 week class we can design a personalized class based on your interests. To inquire please call 630-360-1410 or email info@allthingsartstudio.com ​ for details. Painting, drawing, silk painting, watercolor, and Clay. *We are in the process of developing more Adult Classes- please see our Wine and Art Parties for 1 day Adult Options.